gNappies are great nappies – they’re incredibly slim fitting and look great on – but they do have a few idiosyncrasies that makes them not like any other cloth nappy that I’ve owned/seen. This is not a bad thing but does mean putting them together and putting them on is a bit different too – I thought a little run through might be useful for anyone considering using gNappies (or for anyone already using gNappies but struggling to get a good fit). 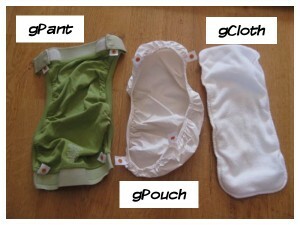 gNappies come in three parts as shown above: the gPant, a cotton outer (not waterproof); the gPouch, a waterproof pouch to hold the absorbent layer; and the gCloth, the absorbent layer with a fleece top to keep baby comfy and hemp and cotton for absorbency. You can replace the gCloth with gRefills, which are a fully biodegradable, disposable option. 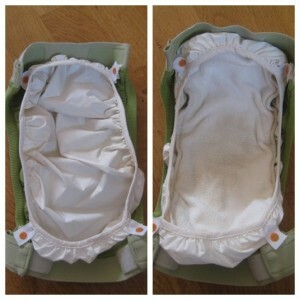 To put the nappy together the gPouch is first poppered into the gPant. 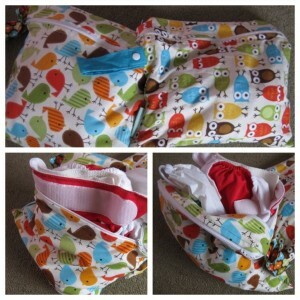 This poppering makes it really easy to replace the pouch when you do a nappy change. It also makes the pouch more flexible within the nappy which helps the pouch keep a good seal (when it’s fitted properly!). The gCloth can then be laid in the pouch. The cloth is slightly larger than the pouch which causes the nappy to fold in half slightly – this is expected and makes sure the nappy fits without the cloth moving about and possibly escaping the pouch. 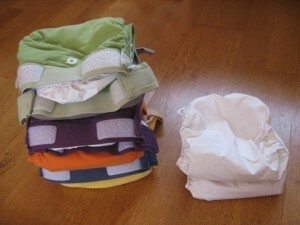 I tend to make up all our nappies at the same time – makes nappy changes a bit quicker. As we have twice as many pouch/cloth combos that gPants I also put the spares together so that I can change Eli into a clean gNappy and then snap in another pouch to the previous gPant. We’re all about saving ourselves a bit of time at the nappy changing station! The ‘g’ logo is on the bum – yes this means that they do up around the back. The tabs must be done up straight and not too tight. 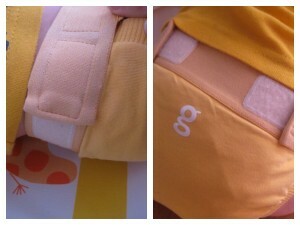 The pouch edges must be within the crease of the baby’s leg – very important! Give the gPant a little tug at the back when you’ve finished the change. 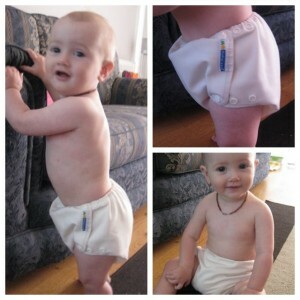 gNappy tabs do up at the back which must be great with a toddler – no tempting tabs to yank undone! It’s a bit strange to do a nappy up ‘backwards’ at first but you soon get used to it. Doing the tabs up straight means no uncomfortable rubbing for the baby. Don’t be tempted to do the tabs as tight as possible – you’ll just end up with lots of leaks around the waistband as the seal will be broken at the top of the pouch. To make sure that the pouch has a good seal around the legs you need to push it inwards so that it is right in the crease of your baby’s leg. This is definitely the most important part of getting a good fit on a gNappy – if the pouch edge is too far out you’ll struggle to avoid lots of leaks around the legs. Just give the gPant a little yank at the back (the back should be slightly higher than the front) and baby’s all set for 2-3 hours of gNappy wear. Blueberry coverall wrap – they do one in the same pattern as Eli’s sling, I am powerless to resist. With one a month this could take a while to get through but I’m going to try as many as I can before Eli potty trains. Right, clearly I am rubbish at posting regularly but let’s see if I can keep motivated this time. This will be a bit of a mishmash post but I’ve got to start somewhere. Eli will be 10 months old in 2 days – currently he is asleep in bed upstairs by himself. This is a recent development as until a few weeks ago he would sleep on me each evening until I headed to bed. Now that he goes to bed alone (give or take two or 10 trips upstairs to settle him again) I have a bit more of an evening. Whilst baby cuddles are lovely, finally sorting out the lounge (2 bags of paper recycling!) and getting my BFN coursework done is a relief. Sadly nights have been somewhat awful recently – he’s heading into another developmental spurt (love the Wonder Weeks for warning me) or maybe more teeth are on their way. He finally got his first two teeth last month so teething has started in earnest. He is also now an accomplished crawler and is working hard at his standing and cruising. He is much more cautious than the other two ever were so is likely to be a bit later at walking, it does seem strange that Lex and Tilly were both walking at the age he is now but they were both much less bothered about falling over! We are still using cloth nappies full time – we even took them to Center Parcs at Easter – and am enjoying having decent weather to dry them outside. My favourites are definitely my Tots Bots Easyfits during the day and Tots Bots bamboozle stretchies at night (with a Motherease airflow wrap). Our cotton night nappies just weren’t up to the job – Eli seems to be a fairly heavy wetter and wet sleeping bag and bed was tiresome. The bamboozles have been great though. This week Tilly starts her settling in sessions at school. She gets two afternoon story sessions and then two full mornings. She is very ready for school! Currently she would like to know how to read and so we are teaching her (in a very low key way) and she is starting to recognise a few letters and blending simple CVC words like C-A-T. Her best friend from nursery will be joining her at school and they seem to be at a similar level which hopefully means they’ll be put in the same groups. Lex is only a few weeks away from finishing Year 1. He will be in a mixed Year 1/2 class again next year but as of yet we don’t know who his classmates will be nor who his teacher is. He continues to be a very able reader – currently he is reading Harry Potter (Mumsnet cliche but nevermind), the Enchanted Wood (Enid Blyton) and the Witches (Roald Dahl). We are working on his handwriting as this is a bit hit or miss – I’ve decided that the school is basically good but there are a couple of places they are a bit patchy on so Lex gets some homeschool. So, that’s a start – will once again try and do better at regular updates, however, am likely to fail sadly. 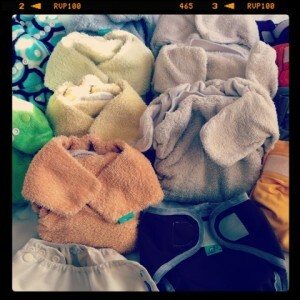 We currently have enough nappies to mean I only have to wash every third or fourth day. We may have enough (but they are so lovely and I might be ever so slightly addicted).